This picture speaks to me of Renewal. Refreshing. Rekindling of hope. 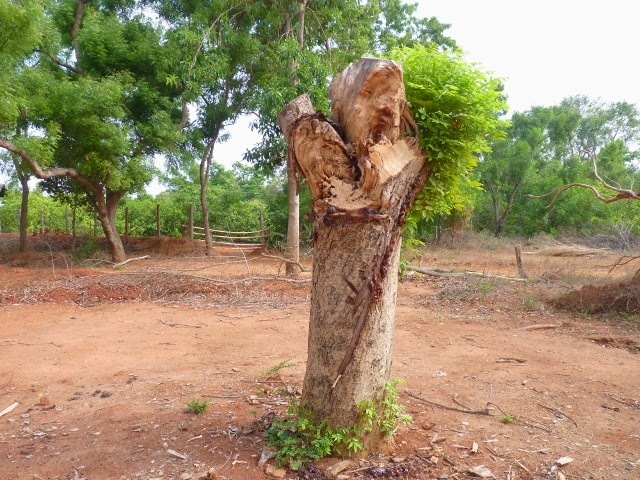 This picture was taken by me in Auroville a few months after the mighty destructive cyclone Thane hit Pondicherry and Auroville area on December 30, 2011. 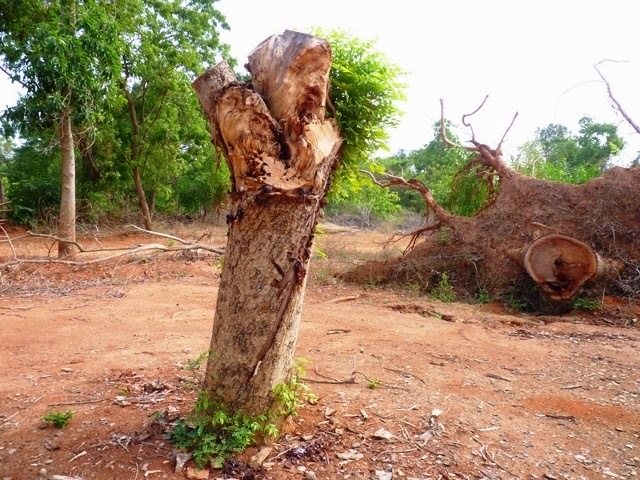 According to some estimates, about 40% of the trees in Auroville were uprooted or destroyed because of the devastation. (And if you know anything about Auroville, you must know something about its thick green cover, its massive trees and vegetation and its red earth. And you perhaps also know about the 40 years of hard work and great effort put in by the dedicated Aurovillians and local villagers to convert what was once a barren land into a green paradise.) After the cyclone, it took several days to clear up the roads and streets of this international township, and power was restored only after two weeks to the whole area in and around Auroville. My own little garden at home (near Auroville) suffered some loss because of the cyclone. But I am not interested today in that memory of loss and destruction, or that memory of nature's fury and chaos. I want to think of the new beginnings instead. I want to think of new life that comes after death, new growth after destruction. That is the story this picture tells. I clearly remember the day when I took this picture. I had gone to Auroville Visitor Center with my husband, and my niece who was visiting us from Delhi. We were planning to do some shopping and have lunch at the cafe there. I saw this tree stump in the parking lot itself, and was pleasantly surprised to see the new tender green leaves sprouting at the base and the top. What a sight of hope, new life! While a reminder of what this tree once was was still there nearby in the form of an uprooted trunk of another big tree, the new growth was a proof positive that life doesn't stop. It only takes a little pause now and then, to recuperate its strength, to rejuvenate itself with fresh energy and soon it bounces back. Full of vigour, full of new energy, full of hope and new beginnings. That's what I remember feeling when I witnessed this sight. The timing was also important because my niece was visiting with an objective to study Economics with me for a few weeks as part of her preparation for her senior secondary examinations (12th grade). She was feeling a bit doubtful about this subject and needed a little boost, a sort of a push to regain her confidence and will to study well for her forthcoming examinations. She is an intelligent young woman, but it is just that her kind of intelligence is not always recognized or valued by the kind of examination and grading pattern we have in the mainstream Indian schooling system, especially at the level of "board" examinations. And the system is such that if a student doesn't score well in these public examinations, her further education including admission to a good college may become very difficult. She knew she needed to do well, at least reasonably well, in the examinations, but just needed some gentle push and some one-on-one guidance for at least a little period of time. And of course I was extremely happy when she chose to come and stay with me and thought that I could be the person to give her what she needed. I can't say what, if any, help I was for her at that time. But all I can say is that the visit provided me an opportunity to bond with my lovely young niece and renew myself with that youthful energy. I also got an opportunity to recognize and realize what an important asset a healthy sense of self-confidence is, especially for the youth preparing themselves for the big world out there. A renewal of this confidence in oneself, in one's capabilities and unique intelligence is necessary from time to time. For all of us. We all go through times when a refresher dose of hope and optimism is required. This rekindling of hope, this constant renewal is what gives us the persistent strength to go on pursuing our dreams, walking toward the unknown-to-us future. That, I believe, is life. A journey, a seeking, a promise of renewal. Sort of like a promise of re-doing, a rebirth almost. In renewing and refreshing ourselves we rediscover ourselves. And perhaps that's how we also re-dedicate ourselves to our goals, dreams and aspirations. The more we can open ourselves to the Light and Force, the eternal source of all that hope and energy and optimism, the more alive and living we begin to feel. Ready to begin anew. Linking this post with Write Tribe Wednesday Prompt - Memory triggered by a photograph.